The F-600 Super Duty is designed to provide customers with a strong GVWR in a smaller package. The F-600 delivers the capability of a Class 6 truck - including a maximum GVWR of 22,000 pounds - in a familiar Class 5 Super Duty package. With F-600, customers no longer have to choose between a truck that doesn't have enough payload to carry all the tools they need to a job site and a truck that's too big. The Built Ford Tough F-600 stands poised to go where bigger trucks can't. Along with the F-600, Ford also announced that it would complete the refresh of its commercial vehicle lineup, with updates to the Super Duty chassis cab, medium duty trucks, E-Series, Transit and its stripped chassis. "Ford has consistently sold more commercial vehicles every year than any other manufacturer because we listen to our customers then get to work developing the products and technologies they need," said Mark Buzzell, Ford director of fleet, lease and remarketing operations. "The updates we're announcing today were driven by our customers' focus on improving safety, reducing cost, and increasing uptime and productivity. Giving our customers the freshest lineup plus driver-assist technologies and connectivity is a great example of Ford delivering smart vehicles for a smart world." 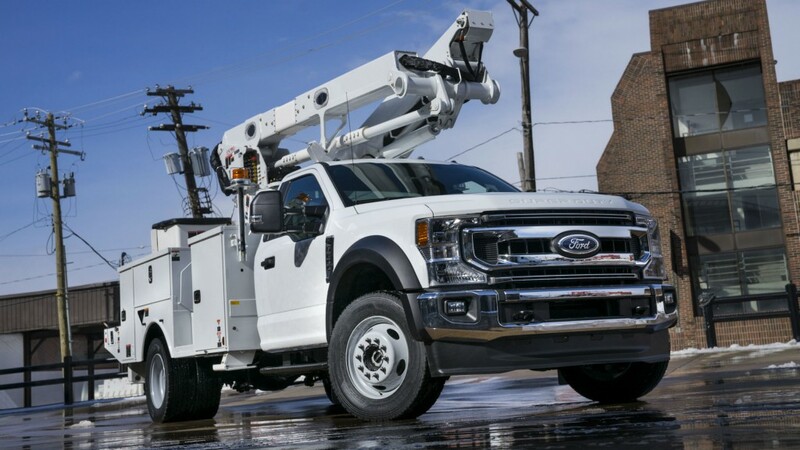 Although the overall vehicle is the same size as an F-550, F-600 uses upgraded driveline and chassis components, as well as higher-weight-rated 19.5-inch tires and wheels to help it achieve a higher GVWR. With Ford's class-exclusive choice of gasoline or diesel powertrains and 4x2 or 4x4 drivetrains, F-600 lets fleets spec the truck they want instead of settling for one that's available. F-600 can be ordered in early 2020 and will be available in mid 2020. Ford's all-new 7.3-litre V8 gasoline engine that debuted last month in F-Series Super Duty pickups is also available in Super Duty chassis cab, F-650 and F-750 medium-duty trucks, E-Series, and F-53 and F-59 stripped chassis. This 7.3-litre V8 generates more torque and power than the 6.8-litre V10 engine it replaces. Its compact package provides greater maintenance access for technicians and because it has two fewer cylinders, it also uses fewer parts than the outgoing V10, resulting in less downtime at the shop and lower long-term ownership costs. Based on decades of commercial engine experience, the 7.3-litre uses an all-new cam-in-block, overhead-valve architecture with cast iron block and forged steel crankshaft for maximum durability. Port injection with variable-valve timing optimizes the intake and exhaust to match performance with workload. Oil jets cool the pistons under heavy loads. New for 2020 Super Duty chassis cab, customers can choose from three engines - the 7.3-litre gas V8, a third-generation 6.7-litre Power Stroke diesel or a 6.2-litre gas V8. An all-new 10-speed TorqShift automatic transmission is available across all engine offerings with available live-drive power takeoff provision with up to 300 lb.-ft. of torque. Ford is the only manufacturer to offer both gas and diesel engines in its Class 6-7 trucks. Offering a choice between the new 7.3-litre gas engine and 6.7-litre Power Stroke V8 diesel allows customers to spec the performance, efficiency and cost benefits that are right for their business. Both engines are mated to Ford's 6-speed TorqShift heavy-duty automatic transmission. All Ford commercial vehicle product lines are updated with standard modems with 4G LTE Wi-Fi for up to 10 devices to help keep drivers and crews connected while on the job or on the road. New Ford Telematics and Ford Data Services are available across the lineup to help commercial customers operate their fleets more efficiently. Ford Telematics and Data Services enable fleet managers to enhance uptime and asset utilization, optimize running costs, improve driver behavior, and protect their fleets using Ford OEM-grade telematics software, integrating with the company's existing telematics service provider or taking vehicle data directly into their own IT systems - giving them the power of choice. Additional elements of Ford Co-Pilot360 technologies become available on Ford commercial vehicles for the new model year. For F-650 and F-750 medium duty trucks, plus E-Series and F-53 and F-59 stripped chassis, traction control, hill start assist and auto headlamps are standard. Optional elements on these lines include adaptive cruise control, electronic stability control, lane departure warning, Driver Alert System and auto high-beam headlamps. Super Duty chassis cab adds standard auto high-beam headlamps and available lane departure warning. The smartest Transit ever adds standard forward collision warning, post-collision braking, Lane-Keeping System and auto high-beam headlamps. New available driver-assist technology for Transit includes adaptive cruise control, Blind Spot Information System with trailer coverage, enhanced active park assist, side sensing system, front and rear split-view camera and adjustable speed limiting device.